I mentioned in this post that the Impromptu Lecture with the Village Squares Quilters went well once I’d settled down. Jayne wanted to hear a little more so here I go. Over the last couple of years I’ve learned that when I get mad I can start talking really slow and very deliberately. When I get nervous I talk very, very fast. I have enough quilts to talk for an hour, easily…but then talking fast for the first little bit the trunk show was just under an hour. I’d also worked myself into a migraine as I couldn’t find “Twilight in the Bronx” and “El’s Flower Garden” until that morning when I remembered I’d hung them in the closet. That sigh of relief could be felt in Australia…ok, not really but I was really freaking out thinking I’d lost two of my quilts. I left “Split Complimenterity” at home, since it was on the bed and I’d spent so much time looking for the other quilts I didn’t have time to take the lint roller brush to it and remove all of the cat hair. The guild program starts after the member show & tell, which is after lunch, and after the board meeting oh and after the general meeting. I took notes with me to remember a few things like sharing the pattern design I’d just completed for Marcus Brothers and the articles I’ve written. It took a few minutes to settle into a good rhythm of talking about my quilts and my experience as a quilter but once I settled down the talk went well. I love talking about quilting, the process, the challenges I’ve had over the years including the time I cut my finger with my rotary cutter. Wasn’t watching where my fingers were and I didn’t use a 3″ wide ruler again for a very, very long time. One of my very favorite quilts is the one above, “49 Pieces of Chocolat”. “Chocolat” is a Moda line I fell in love with a few years ago and I picked up a charm pack of (50) 5″ squares. I counted several times as I thought out the quilt, I had all 50 squares. As I got to the last piecing row I couldn’t find one of the squares. I looked and looked and looked. Some how it disappeared into the “sewing room vortex” never to be found…ever. 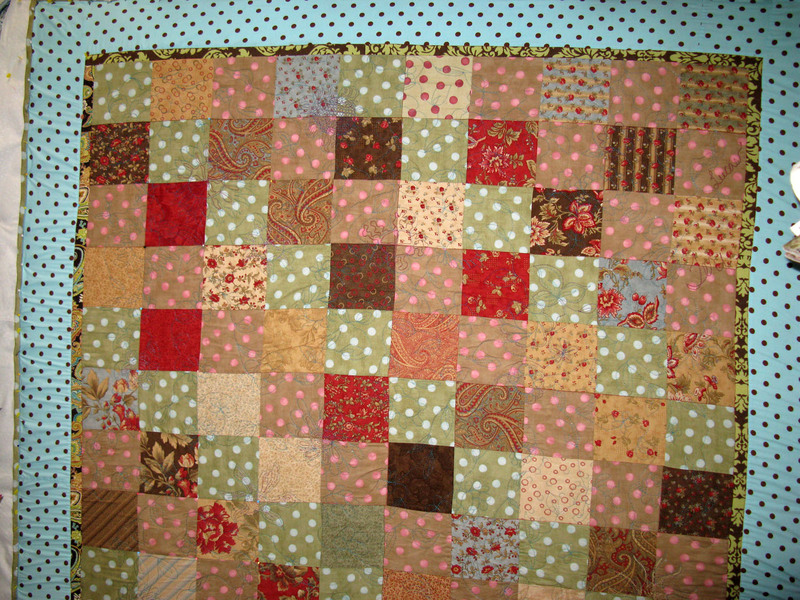 As I look at the picture I see that I have the quilt upside down and the row where the replacement square is featured. Since the colors and tone match well with the “Chocolat” line I won’t point it out. I also brought “There are Cats on my Quilt” sharing the story of the challenge I participated in and the variety of quilting techniques I played with. I did remember to bring the “Gallimaufry” CD where “Twilight in the Bronx” is the cover art for the CD. 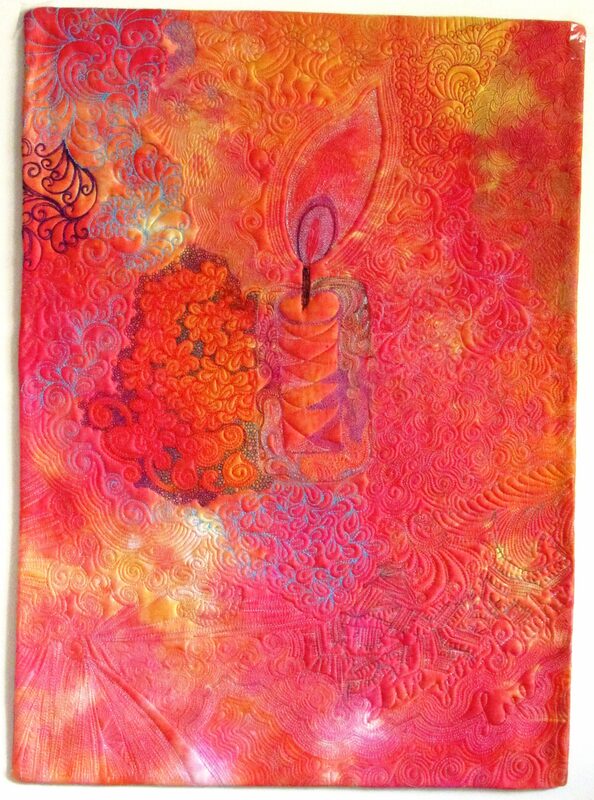 This is soooo much fun to share with anyone…it’s so cool to have a quilting cross into another form of art! Several members shared with me that they enjoyed the trunk show and one shared with me that I’m ready for “prime time”. That made me smile deep down. I can hardly wait for the next opportunity to share my quilting journey. Teri, you are prime time! Thanks, It sounds like I missed a good time. You did a great job getting prepared so quickly, so talking fast seems quite normal to me. Hope your audience appreciated all your talent. Teri…I know about that sewing room vortex…haven’t found my baggie of cut squares yet! I am starting to think that I imagined buying them! I bet you did fine in your lecture! It’s 7:15 Saturday evening. I haven’t worked since Wednesday night, but I haven’t done a quilting thing yet – Thanksgiving and house stuff and family stuff and, and, and. I was going to hang it up again tonight, but reading your blog was all I needed – I’m off to spend a few hours in my quilting room! Thanks! !